Addiction Medicine Lures A New Generation Of Idealistic Doctors : Shots - Health News Once a tiny specialty that drew mostly psychiatrists, addiction medicine is expanding its accredited training to include residents from specialties like family medicine who see it as a calling. The U.S. surgeon general's office estimates that more than 20 million people have a substance-use disorder. Meanwhile, the nation's drug overdose crisis shows no sign of slowing. Yet, by all accounts, there aren't nearly enough physicians who specialize in treating addiction — doctors with extensive clinical training who are board certified in addiction medicine. The opioid epidemic has made this doctor deficit painfully apparent. And it's spurring medical institutions across the United States to create fellowships for aspiring doctors who want to treat substance-use disorders with the same precision and science as other diseases. Such programs are drawing a new talented generation of idealistic doctors — idealists like Dr. Hillary Tamar. Tamar, now in the second year of a family medicine residency in Phoenix, wasn't thinking about addiction medicine when she started medical school in Chicago. "As a medical student, honestly, you do your ER rotation, people label a patient as 'pain-seeking' and it's bad," Tamar says. "And that's all you do about it." "I was able to connect with people in a way that I haven't been able to connect with them in another specialty," the 28-year-old recalls. Working with patients there transformed Tamar's understanding of addiction, she says, and showed her the potential for doctors to change lives. "They can go from spending all their time pursuing the acquisition of a substance to being brothers, sisters, daughters [and] fathers making breakfast for their kids again," she says. "It's really powerful." When Tamar finishes her residency, she's planning to pursue a fellowship in addiction medicine. She sees addiction medicine, like primary care, as a way to build lasting relationships with patients — and a way to focus on more than a single diagnosis. "I love when I see addiction patients on my schedule, even if they're pregnant and on meth," she says. "More room to do good — it's exciting." Doctors with Tamar's enthusiasm are sorely needed, says Dr. Anna Lembke, medical director of addiction medicine at Stanford University School of Medicine and a longtime researcher in the field. "Even 10 years ago," Lembke says, "I couldn't find a medical student or resident interested in learning about addiction medicine if I looked under a rock. They were just not out there." But Lembke sees a change in the upcoming generation of doctors who are drawn to the field because they care about social justice. "I now have medical students and residents knocking on my door, emailing me. They all want to learn more about addiction," Lembke says. Historically, the path to addiction medicine was through psychiatry. But that model started to change in 2015, when the American Board of Medical Specialties — considered the gold standard in physician certification in the U.S. — recognized addiction medicine as a bona fide subspecialty and opened up the training to physicians from many other medical fields. Until then, Lembke says, there had been no way to get addiction fellowships approved through the nationally recognized Accreditation Council for Graduate Medical Education. And that made recruiting young talent — and securing funding for their fellowships — difficult. "We have got an enormous gap between the need and the doctors available to provide that treatment," Lembke says. "At least the medical community has begun to wake up to consider not only their role in triggering this opioid epidemic but also the ways they need to step up to solve the problem," she says. So he moved to Seattle to complete a yearlong fellowship at Swedish Cherry Hill Family Medicine Residency. There he learned, among other things, how to treat pregnant women who are in recovery from drug use. "I really needed to do a fellowship if I was going to make an impact and be able to teach others to make the same impact," says Peterson, who went on to help found an addiction medicine fellowship program in Arizona. His program is based in Phoenix at the University of Arizona's medical school, and its teaching hospital run by Banner Health, and the Phoenix VA Health Care System. Arizona's two addiction medicine fellowship programs received ACGME accreditation last year — a stamp of approval that made the programs desirable choices for up-and-coming physicians, Peterson says. Not every doctor who plans to treat substance-use disorders needs to do a fellowship, he says. In fact, his goal is to integrate addiction medicine into primary care settings. Public health leaders have been pushing to get more physicians trained in evidence-based treatments like buprenorphine, which has been shown to reduce the risk of death among people who have recovered from an opioid overdose. "As we provide more education and more support to primary care physicians, they will feel more comfortable screening and treating for addiction," Peterson says. Peterson's own journey into addiction medicine began during a rotation with a family doctor in rural Illinois. "In moments that most doctors find uncomfortable — maybe a patient comes in to request pain medication and you're seeing the negative side effects — he did not shy away from that situation," Peterson says. "He addressed it head-on." "In 20 or 30 years from now," Peterson says, "those medical students are going to look back at my current generation of doctors, and we will be judged by how we responded to this epidemic," in the same way he and his peers now look back at how doctors handled the HIV epidemic. One of the first steps in stopping the epidemic, he says, is making sure there are enough doctors on the ground who know how to respond. Many of today's medical students, people like Michelle Peterson (no relation to Luke), say they feel the calling too. 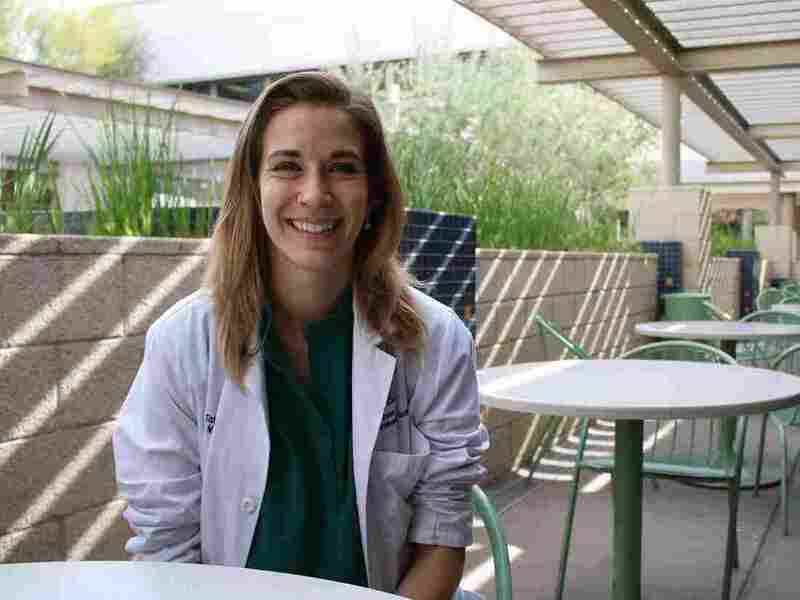 She's in her first year at the University of Arizona College of Medicine in Phoenix and became interested in addiction after working at an outpatient treatment center. 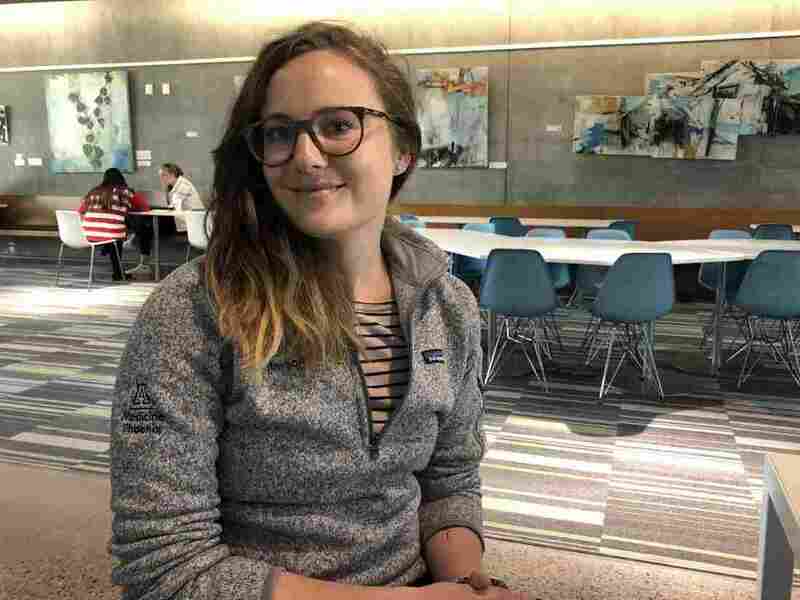 She says she's already learning about addiction in her classes, hearing from doctors in the field and seeing other classmates equally engaged. "It's definitely not just me," she says. "There are quite a few people here really interested in addiction." It's a trend she and her mentors hope will continue. This story is part of NPR's reporting partnership with KJZZ and Kaiser Health News, an editorially independent news service of the Kaiser Family Foundation that is not affiliated with Kaiser Permanente.